Flashes and floaters occur when the vitreous gel that fills up 80 percent of the volume of the eye begins to liquefy and pulls away from the back of the eye. 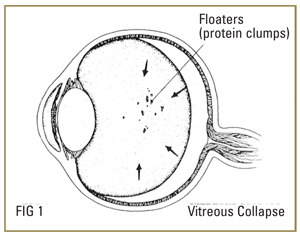 Floaters are protein aggregates that are more pronounced when they first occur and are typically seen most easily against a bright background. Bleeding inside of the eye can also cause a sense of looking through floaters. If the inner lining of the eye, the retina, is thin, the vitreous can pull on this area to produce a tear. 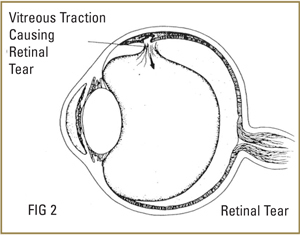 Persistent pull on the tear can lead to a retinal detachment, a condition in which fluid gets under the retina and lifts part or all of the retina away from the back of the eye. Fresh retinal tears and detachments should be treated urgently since rapid loss of vision can occur. The success rate for repair of a recent uncomplicated retinal detachment approaches 90 percent. Laser treatment can often be conducted in the office to seal a retinal tear if there is no detachment. However, close follow-up is necessary to make certain that the retina does not detach despite laser treatment. Pneumatic retinopexy is also an office-based procedure using laser or freezing therapy to seal off a tear, followed by injecting a small gas bubble into the eye to reattach the retina from inside the eye. 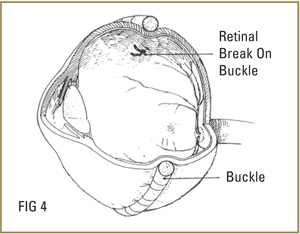 Scleral buckle surgery is conducted in the operating room. A permanent, external support to the peripheral retina is supplied by placing a silicone band around the outside of the eye. Such a buckle is generally not visible after the eye has healed. Vitrectomy surgery is also an operating room procedure that is used by itself or can be combined with a scleral buckle. A small cutting instrument is used to enter the eye through a 1 mm incision, and the vitreous gel is removed and replaced with a gas bubble. The advantage of this method is that all the debris, scar tissue and membranes on the retina can be removed, and the retina flattened at the time of surgery. A laser is used to seal off the tears. 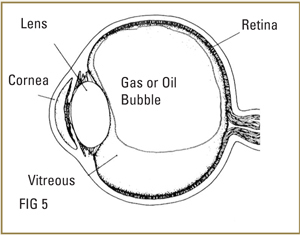 Gas and silicone oil are support agents used inside the eye to keep the retina attached while permanent bonding occurs. A gas bubble is gradually absorbed over a period of several days to several weeks, depending on the specific gas used. A patient cannot travel by air with a gas bubble inside the eye. Silicone oil may be necessary if longer support is required. This allows the eye more time to heal. However, silicone oil is often removed from the eye by a later surgical procedure once the retina is stable. Patients with silicone oil inside their eyes can fly safely. Vitrectomy, scleral buckle and gas are sometimes used in combination. Anatomical success rate can be as high as 80 – 90 percent. However, some eyes will develop recurrent retinal detachment and may need additional surgery. Surgery is generally performed as an outpatient procedure, and patients may go home the same day. Healing time varies from several weeks to months depending on the extent and severity of the detachment. If the center part of the retina (macula) has been detached, the central (reading) vision may not completely return. Your doctor will instruct you about postoperative eye drops and activities. Generally, allow at least one month before returning to full physical activity. As noted above, always check with your doctor to determine if it is safe to resume air travel. Your eye power may change after the surgery. Glasses or contact lenses are prescribed 6 to 8 weeks after successful healing. Expect the eye to be puffy and red for several days with clear, reddish tears and discharge. Cold packs on the closed eyelids help the swelling go down and provide comfort.